"If you know the enemy and know yourself, your victory will not stand in doubt; if you know Heaven and know Earth, you may make your victory complete." 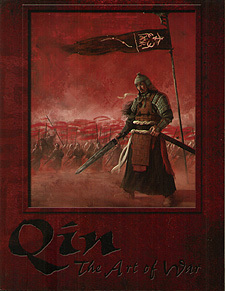 The Art of War is the essential military supplement for "Qin: The Warring States" dedicated to war, military life and the martial politics of the Zhongguo. Gamemasters and players alike will find it an invaluable guide for military campaigns and adventures. A complete overview of all aspects of military life in the Warring States. Exhaustive descriptions of the armies of the Warring States, their elite troops, strengths and weaknesses and famous personalities. Rules for running battles in the game, whatever the scale and involvement of the characters, be it as generals or as fighters in the thick of the action. Two complete scenarios and guidance for the Game Master in creating military campaigns and adventures. New styles of combat, new weapons, legendary objects and more.